Kithnos in Greece. Kythnos. Accommodation. Ferries. Beaches. Kithnos, or Kythnos, is Cyclades ninth largest island, slightly larger than Mykonos and approximately four times less than Naxos, which is Cyclades largest island. Here lives around 1,460 inhabitants and the island's surface is 99 km2. 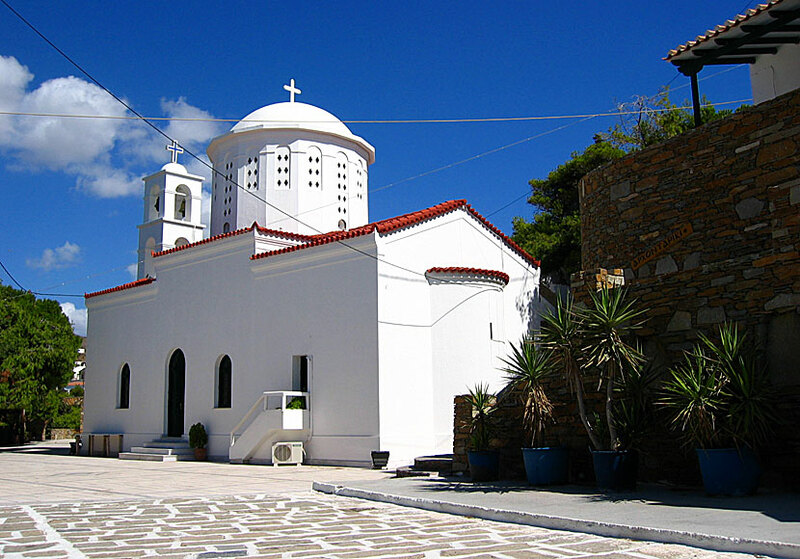 The two main villages are Chora with 560 inhabitants, and Merichas which has 370 inhabitants. The highest mountain is Profitis Elias and measures 336 meters above sea level. 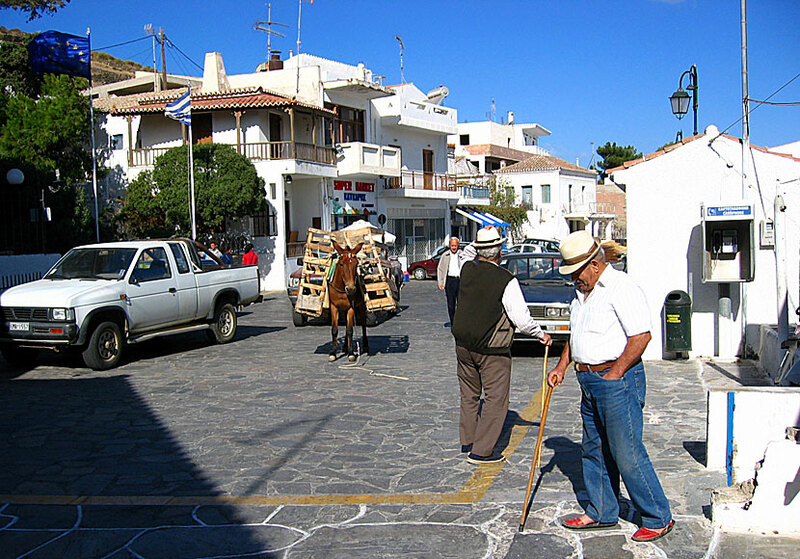 The Greek everyday life dominates in Kithnos. Picture from Dryopida. The main occupation is farming and fishing. 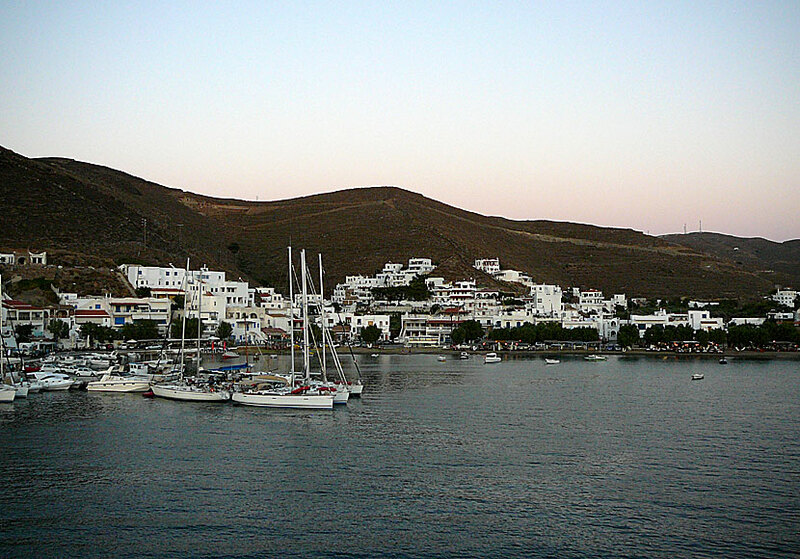 Kithnos is located between Kea and Serifos, as together with Sifnos, Kimolos and Milos are called the Western Cyclades. The flat landscape makes it a rather anonymous island. The beaches are quite mediocre and there are no spectacular sights. However, there is something purely genuine about Kithnos that many islands lack - especially in the picturesque villages Chora and Dryopida. The people on the island are curious and friendly and show what Greek hospitality is all about. Loutra with its hot springs is located north of Chora. 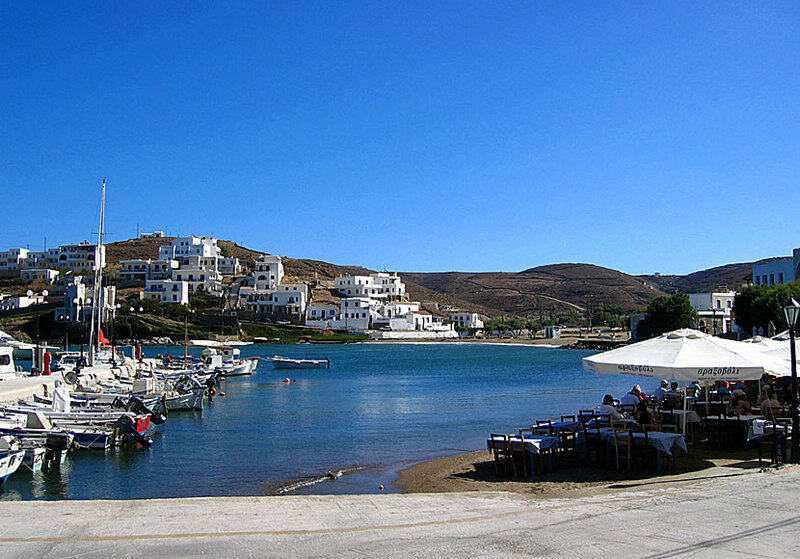 Due to the excellent connections by ferry to both the mainland and the neighbouring islands in the western Cycladic, it is easy to go to Kithnos. The simplest route is by flight to Athens and then on by boat from Piraeus or Lavrio, south of the airport. Ordinary ferries as well as fast catamarans leave from Piraeus every day during high season. 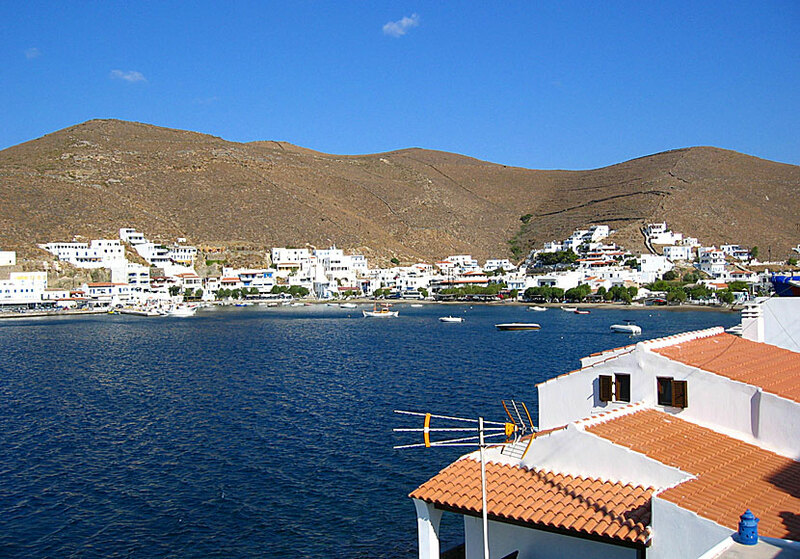 Kithnos also has boat connections with Andros, Tinos, Ios, Syros, Folegandros, Naxos and Paros. Bus departs from Merichas and operates the villages of Dryopida, Chora, Kanala and Loutra up to six times a day. If you plan to stay on the main roads, a scooter will do just as fine as a car. There are very short distances. However, a car is preferable if you plan to see the smaller coastal villages. There are rental outlets for cars and scooters in Merichas. 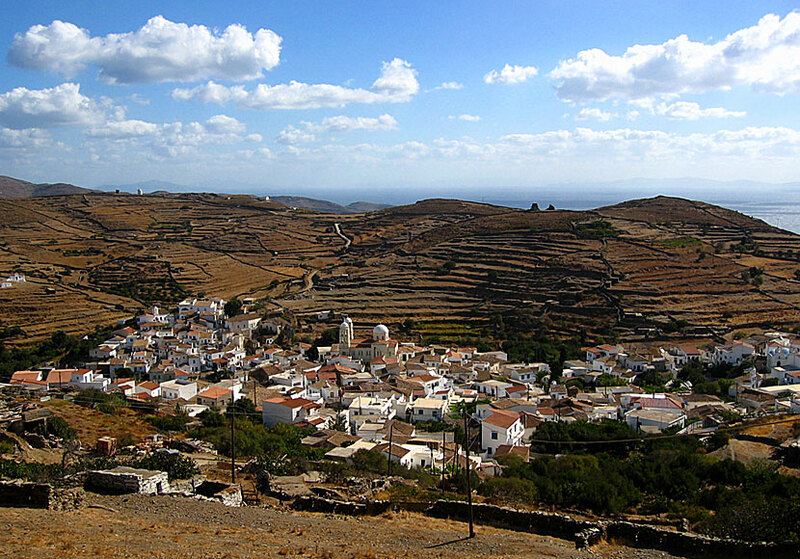 The greatest attractions on Kithnos are the two villages Chora and Dryopida. Below is some information about a few of the villages on Kithnos, other villages are Merichas, Chora, Kanala and Loutra (see photo at the top of the page). Dryopida, is in my opinion, the greatest attraction on Kithnos. It is a true delight to stroll through the car-free labyrinth alleys. Nothing is adapted to tourists in Dryopida. It is constantly full of surprises, it almost like being inside a living dollhouse. The village is divided into a lower and an upper part by a ravine. In the lower part the houses are worn and aged, some lie in ruins. The upper part is prettier and more alive. 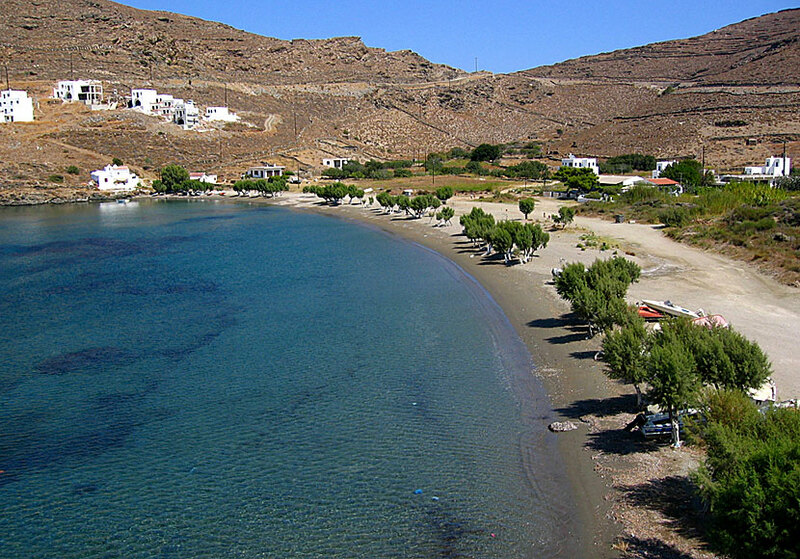 If you are looking for long sand beaches with powder white sand, Kithnos is not for you. The beaches are OK, but no reason to run your legs off. Here is information about some of the beaches. 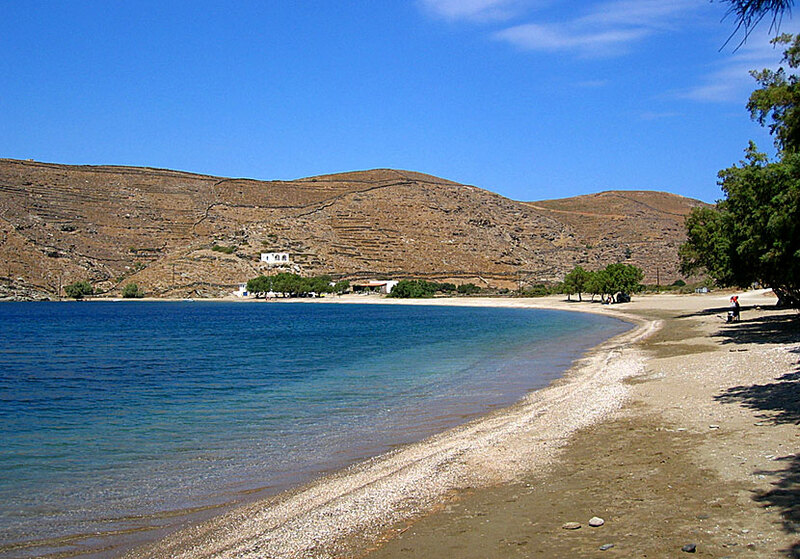 Martinakia beach is located at a comfortable walking distance (5-10 min) from Merichas, just around the corner on the way to Chora. The beach lies in a luxuriant green valley. There is a nice little bay with two tavernas, a couple of pensions and some shade from the tamarisks. The sand is greyish and firmly packed. Episkopi beach is about 20 minutes walk from Martinakia. Apokroussi is avery long sand beach, surrounded by shade-giving trees, in a bay with clear and inviting water. A fertile agricultural landscape spreads out behind the beach. There are two tavernas on the further corner of the beach. 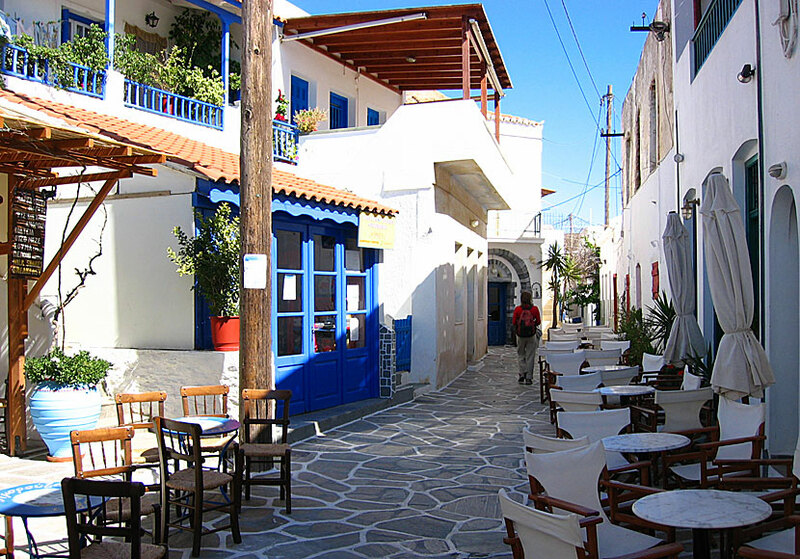 Apart from the nice villages, Kithnos has no special sights. Although, the Katafiki Cave in Dryopida and the monastery Panagia Kanala (in Kanala) are worth a visit. Almost all tourists stay in Merichas. The hotels are spread out on three sides, would you like the morning sun, choose the right side at the far end of the port beach, and if you want evening sun, choose to the hotels above the port. Here are three suggestions for accommodation in the Merichas.